"Is this game only a game?" 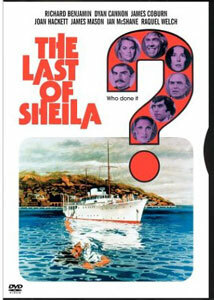 There aren't a whole lot of movies in which the first thing to grab your attention is the screenplay credit, but The Last of Sheila is one of them: "Written by Stephen Sondheim and Anthony Perkins." This intricate, intelligent screenplay is a product of a collaboration between maybe the brightest light in musical theater and Norman Bates, and it shows�in many respects, it's one of those movies that will appeal to every muscle in your body from the neck up, a movie for which the word "clever" is both a compliment and an off-handed disparagement. But if you've got a taste for this sort of thing, this Rubik's cube of a movie is sure to keep you guessing. A few months back, the title character has been mowed down on the mean streets of Bel Air, and now her widowed husband, Clinton (James Coburn), is ready to get back into action. A film producer and self-styled puzzled impresario, he invites six of his and Sheila's closest friends aboard his yacht (named for his late wife) for a week of fun and games. These include Tom (Richard Benjamin), a struggling screenwriter, and his wife, Lee (Joan Hackett); a Hollywood starlet (Raquel Welch) and her consort of sorts (Ian McShane); a film director (James Mason) reduced to shooting commercials; and a zanily powerful literary agent (Dyan Cannon). Reading too much about the plot will rob watching the movie of much of its fun, but there's a lot here to chew over. There are some obvious affinities to a movie like Sleuth, which engages in similar sorts of parlor games; and the large cast is in some ways sort of a lower-rent precursor to Murder on the Orient Express. (Also, given that most of the film takes place aboard the S.S. Sheila, it's hard at times not to think of this as a highbrow Love Boat.) At times it feels a bit overdone (Coburn imploring in fake camp counselor tones: "Come on, people! "), and the acting is uneven�Raquel Welch is typically pneumatic in her swimsuit, for instance, and let's leave it at that. There are certainly times at which you can feel the plot wheels turning; it's not that the movie follows a strict formula, but we're told early on that everyone has a secret that is to be revealed, so we start counting, in the manner of a story like And Then There Were None. Still, the third-act reveals are pretty surprising, and if you guessed them before the fact, you're better at this than I am. The movie is also notable for its costume designer, Joel Schumacher, who went on to favor us with his direction of such classics as St. Elmo's Fire and Batman & Robin; and for the song, Friends, that plays over the closing credits�though it wasn't written by Sondheim, the deeply ironic context for the tune seems frequently to have been lost in Bette Midler's many renditions. Image Transfer Review: This is a very poor transfer, with visual problems in nearly every shot of every scene�the print used seems to have been full of scratches and dirt, more debris seems to have been introduced, and the palette is badly faded and discolored. The movie was shot in the south of France, so some of that still looks lovely; the print and this DVD sure don't, though. Audio Transfer Review: Lots and lots of crackle lead to frequent distortions; it's especially problematic since so much of the story relies on us getting every last word of the dialogue. It's not as glaring a weakness as the video quality, but it still sounds pretty poor. Extras Review: Aside from the original trailer, the only extra is the commentary track from three of the principal cast members. Raquel Welch is at a distinct disadvantage, because she seems to have been recorded alone; she doesn't have much to say, really, and at times sitting and doing this track seems to have been as pleasant to her as dentistry. Richard Benjamin and Dyan Cannon, on the other hand, sat together for their portion, and seem to be having a fine old time, making each other laugh and reminiscing; for Benjamin especially, though, the shoot seems to be dimly remembered. Cannon is sharper, and talks about her character being based on Sue Mengers, at that time the most powerful literary agent in Hollywood; they also allude to the fact that the script is rife with other industry inside jokes, though Monarch Notes for the rest of us are not provided. This is a clever little puzzle of a movie, not a classic, but a whole lot more than Colonel Mustard, in the conservatory, with the candlestick.